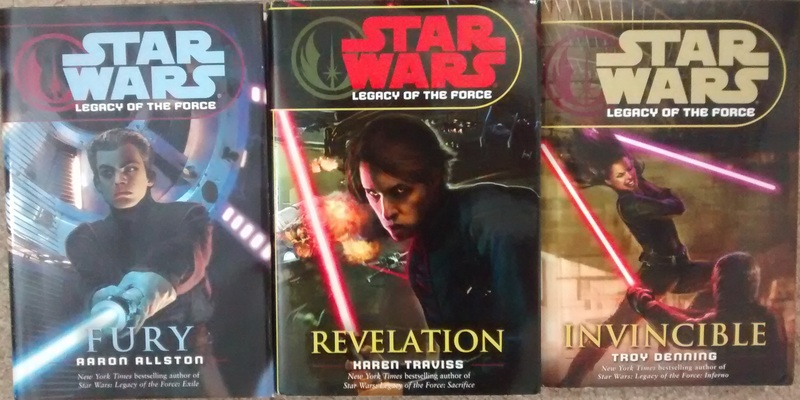 After the NJO, Jacen Solo, aka Darth Cadeus, becomes head of the Galactic Alliance and begins to secretly recruit Ben Skywalker as his apprentice. Ben is having none of it though. 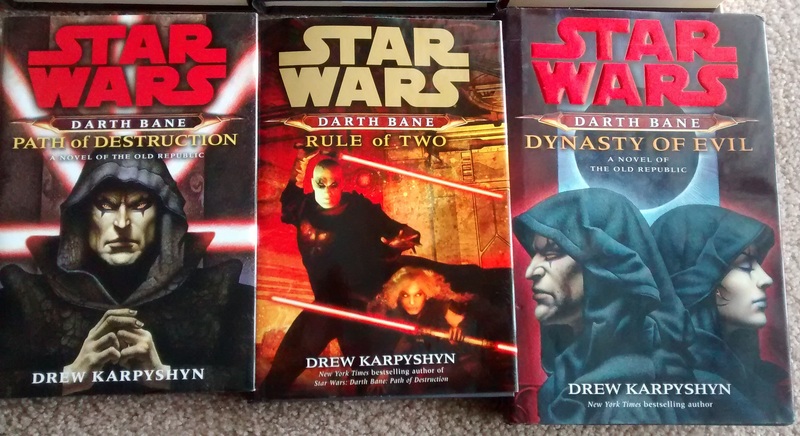 Cadeus openly reveals himself as Sith and begins to follow in his Grandfather’s footsteps. Jaina, as Sword of the Jedi, cuts him down like a two dollar box of cardboard. This is the Legacy of the Force. Next up was Fate of the Jedi. 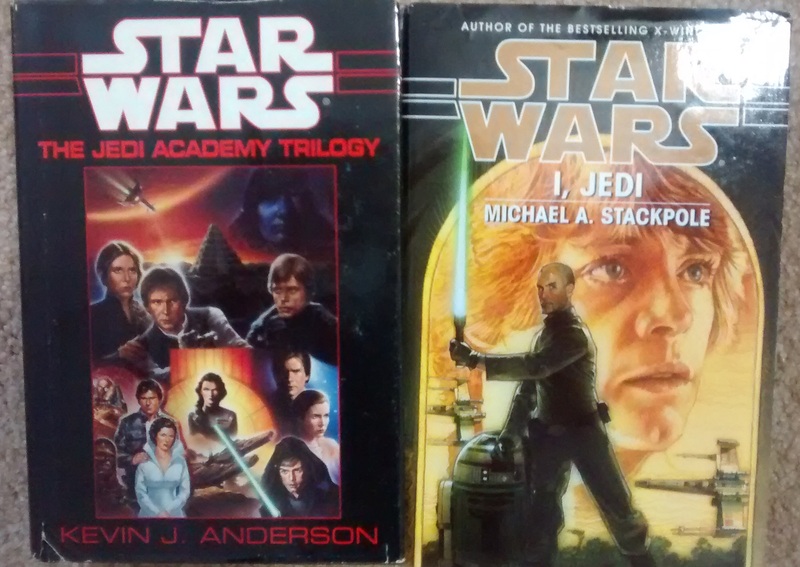 Luke has withdrawn after his complete failure with Jacen and it is up to the other Jedi to keep the Academy running. Unfortunately, Jedi begin going mad on Coruscant and killing until brought down and sedated. Admiral Daala becomes head of the GA and outlaws the Jedi and institutes a hunt that makes Order 66 look like childs play. Now if certain ideas sound familiar, that is because the new movies stole ideas left and right from the old EU books. Of course, they stole all the crap and produced crap films. By the end of FotJ, I was done. 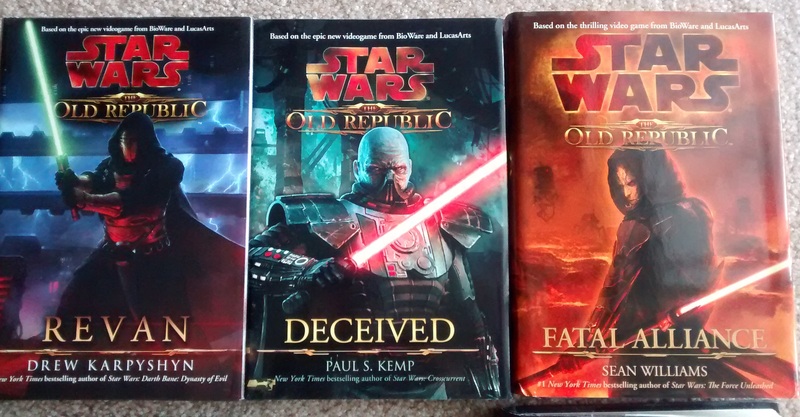 When a whole planet of Sith was revealed, I just gave up. 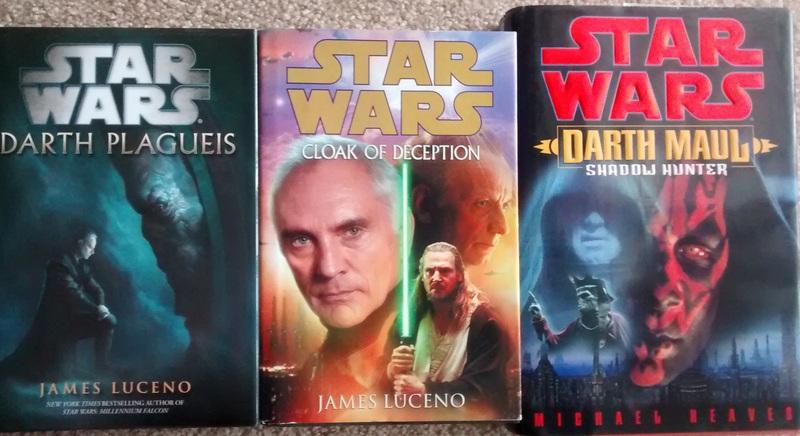 Then Lucas Arts announced that the EU books were no longer canon and everything that I had been following was now just fan-fic. Stabbed in the back by Lucas himself. 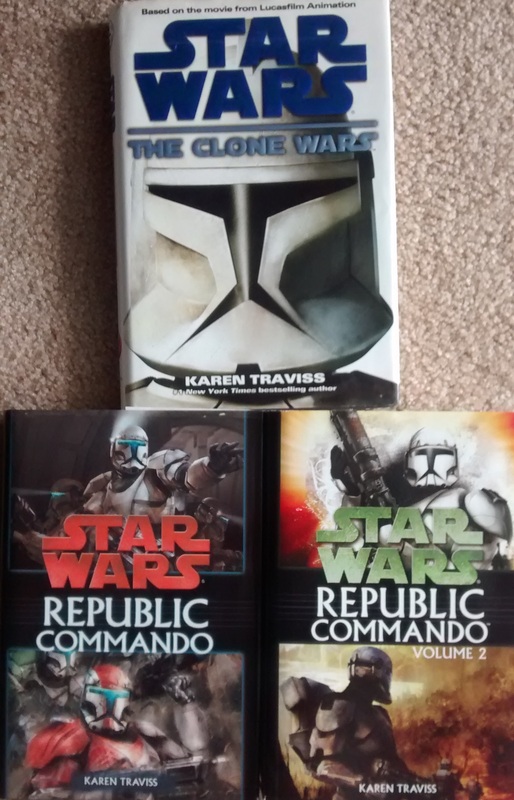 Traviss keeps her Mando story going. Interesting, until it was simply shut down. Bleh. Han and Leia have seen one child die and another turn to the darkside. Oh, and that darksider? He kills Mara, Luke’s wife. What a guy! Han and Leia now have to watch their daughter kill their son. How much misery does this poor couple have to endure? Admiral Daala, former Imperial, is now in charge. And a planet of Sith are revealed. 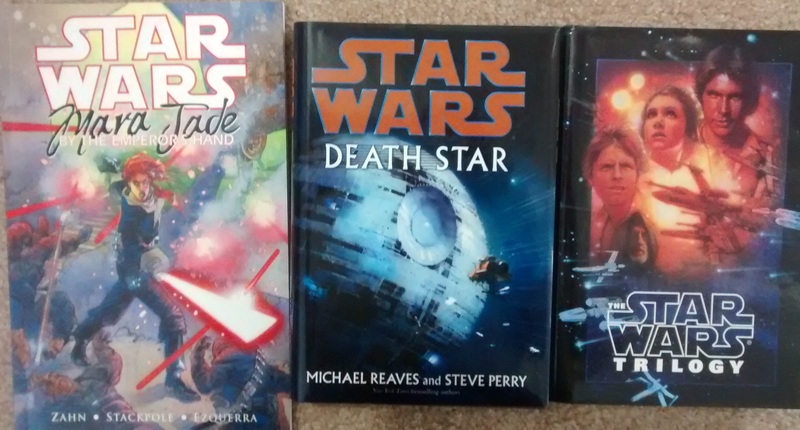 The last 3 Star Wars books I bought. Even as I bought them I knew they couldn’t save my interest. A drowning man’s final desperate grasp onto a sinking straw. In other words, doomed to failure. So there you have it folks. 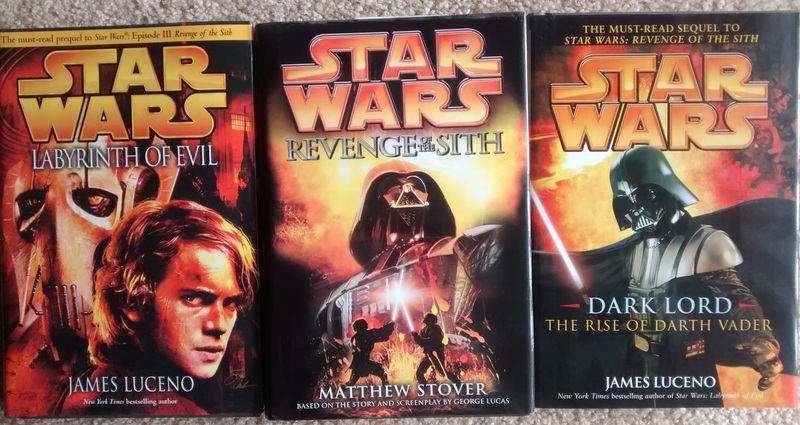 6 days of Star Wars covers. What am I supposed to do with them all? I simply don’t want them any more and worst case, I’ll throw them away. Second worst case is I donate them to a fundraiser my cousin’s stepson regularly participates in. Best case is I sell them for free on Craigslist and score some cash. Well, whatever. I’m over my reading funk by sheer dint of being bored out of my skull. Tomorrow I am going to read all day and make a Survival Saturday post. A good book by Adrian Tchaikovsky and some “interesting” food, sounds like a perfect way to spend my Saturday. 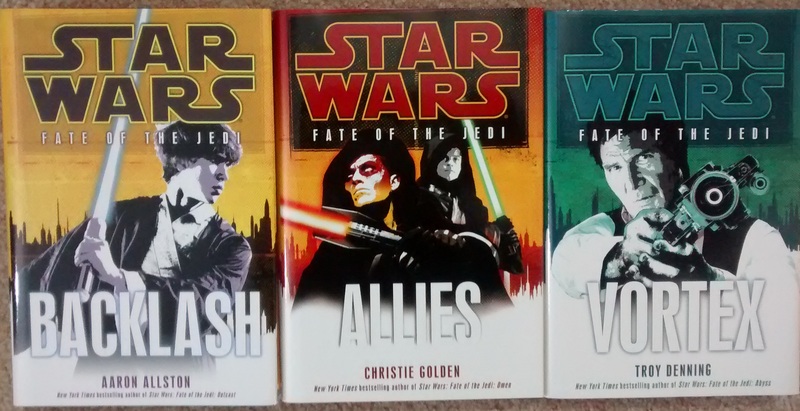 Sadly, someone should have told that to the editors crafting the next series of Star Wars books. 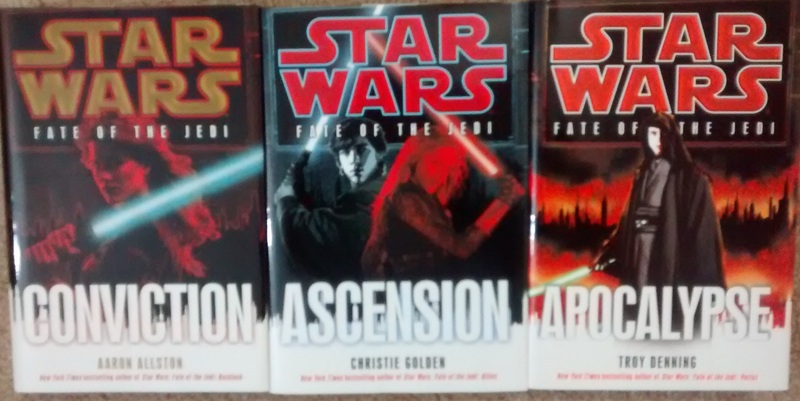 The New Jedi Order was 20+ books long and was nothing but the Star Wars Galaxy fighting off an alien invasion. It delved deeply into grim territory. 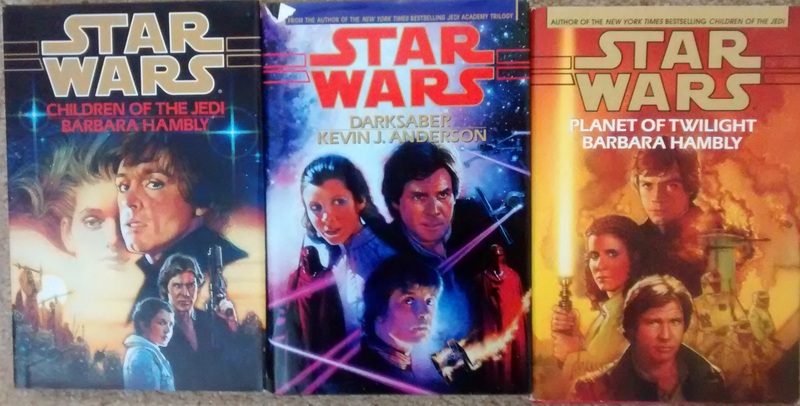 Back in the Correllian Trilogy and other books, Luke and Mara had a son named Ben. 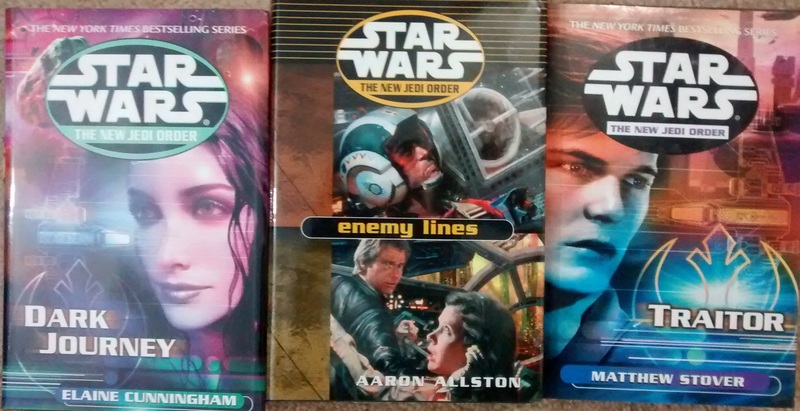 Han and Leia had 3 kids, Jacen, Jain and Anakin. These series were meant to pass on the story torch to a new generation. Sadly, hardly one author could do so and the storylines after NJO became even more convoluted and outlandish. The Star Wars torch began to gutter out. Also, they are a complete culture of warriors. And Chewie dies. These books show some of the best of the EU and some of the worst. Writers, while not quite having a blank check, did not have a lot of backstory to worry about or future story to worry about. It was a wide open range and they wrote with all the vigor of a herd of buffalos. Some of the writings smelled like a herd of buffalos had camped too. Win some and lose some I guess. 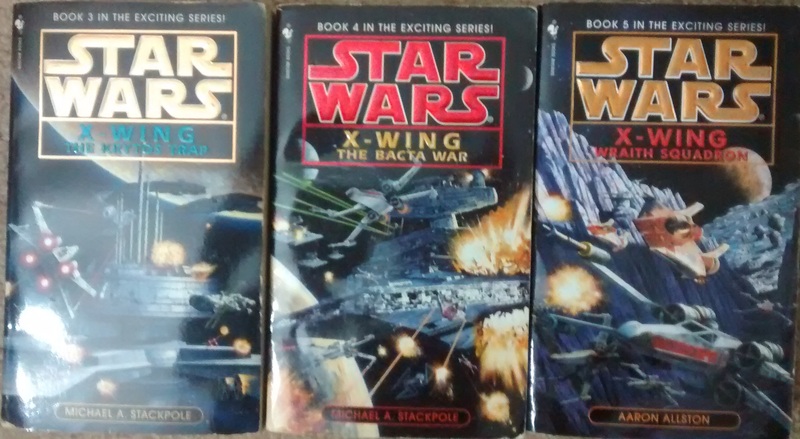 We’re keeping the X-Wing books. 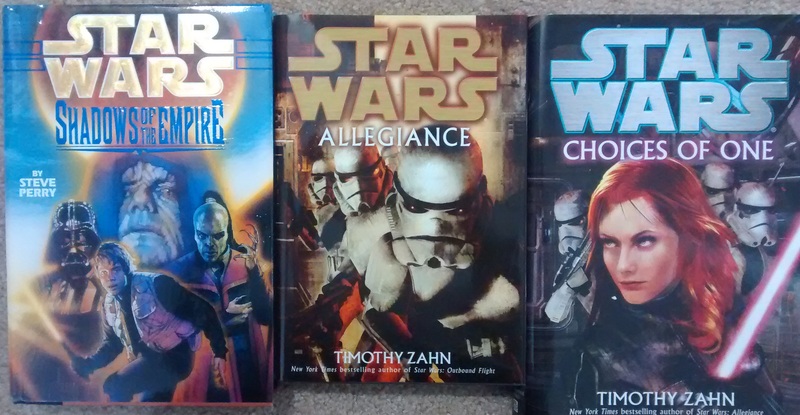 Before there was Mara Jade, there was Callista. She was supposed to be a love interest for Luke. Didn’t work out. 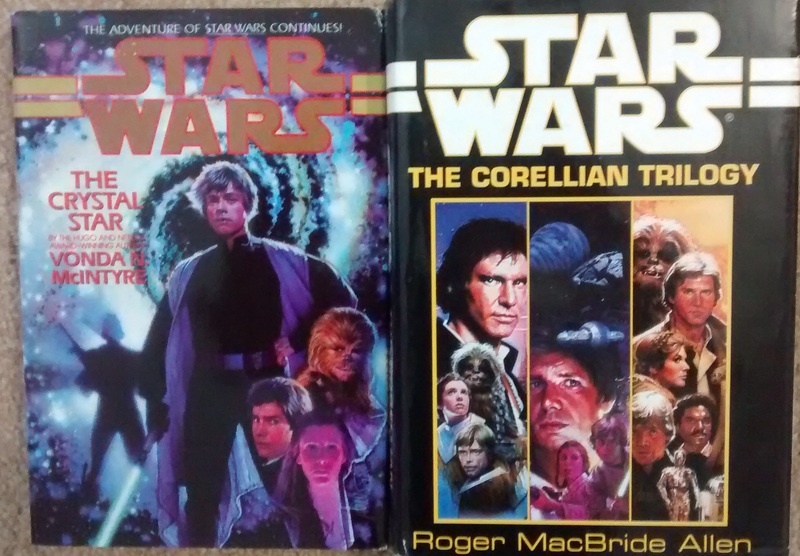 Only a Star Wars Completist would read either of these! 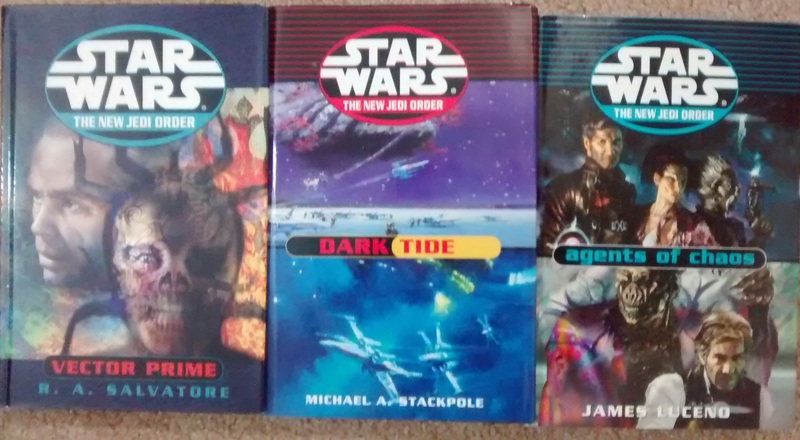 After these books, the Star Wars EU entered into real Franchise territory, with large storylines being plotted out by editors and multiple authors taking up the mantle. Honestly, the Powers that Be wanted Star Wars to be edgier, grittier and darker. 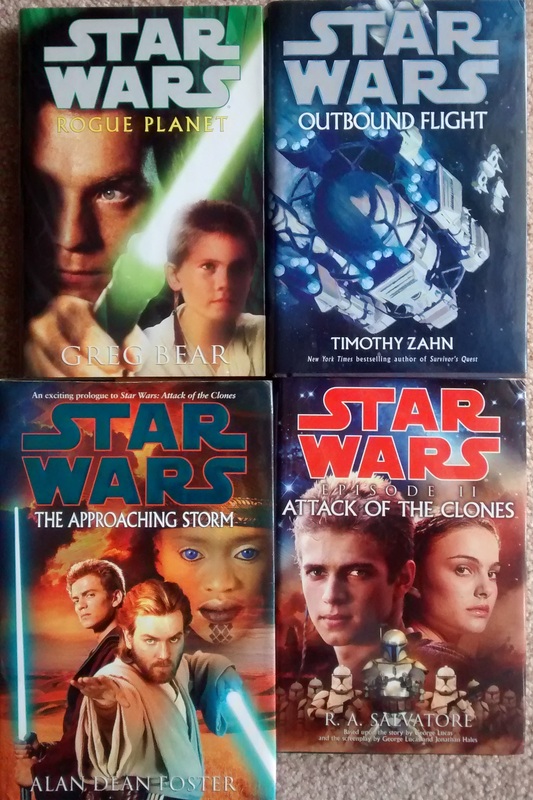 I feel that these books here, no matter how badly written, still captured the spirit of hope and redemption that was showcased in the original movies. Prepare yourselves for dark times ahead. Ok, it is only Wednesday and I’ve already watched way more Youtube than I ever want to for the rest of my life. 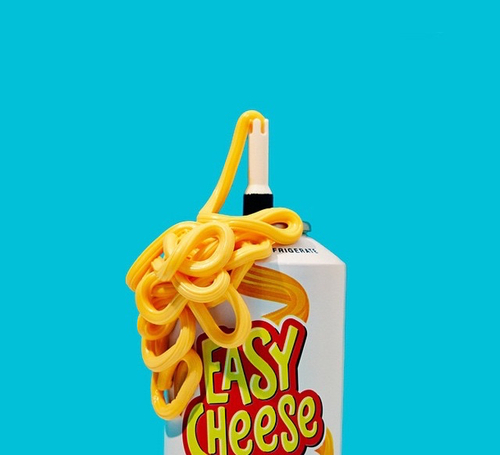 I feel like my brain has inhaled whole bottles of spray cheese. 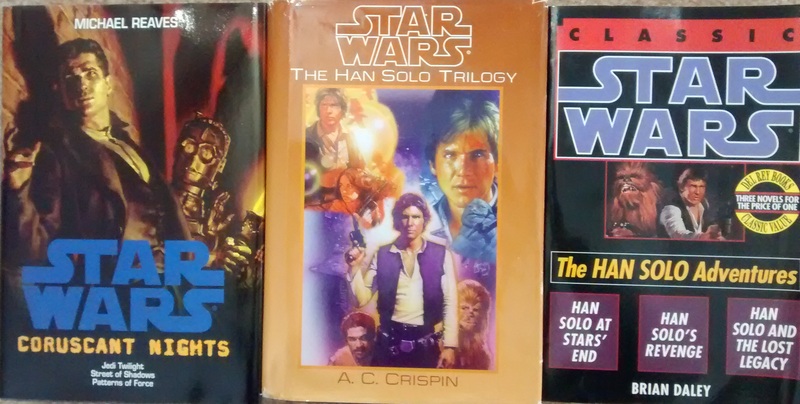 Ok, now we are moving on to books immediately surrounding the first movie trilogy, with Luke, Han and Leia taking centerstage, as they should. 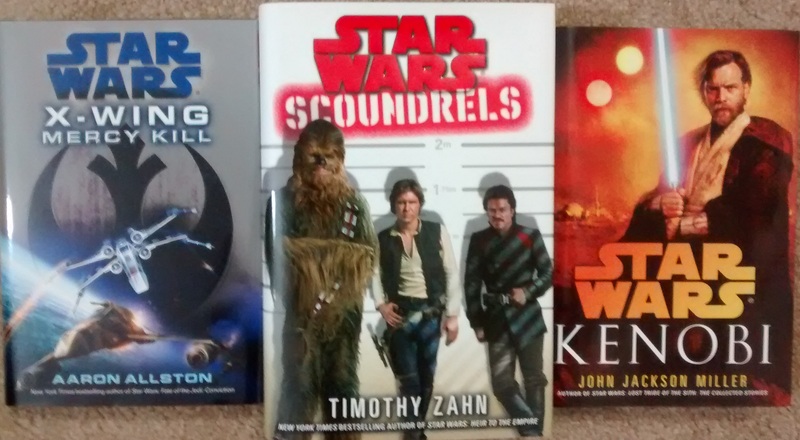 The Han Solo Adventures in individual hardcovers. Written in 1979 and 1980. Awesome baby! Yoda was BLUE in the novelization. Weird huh? 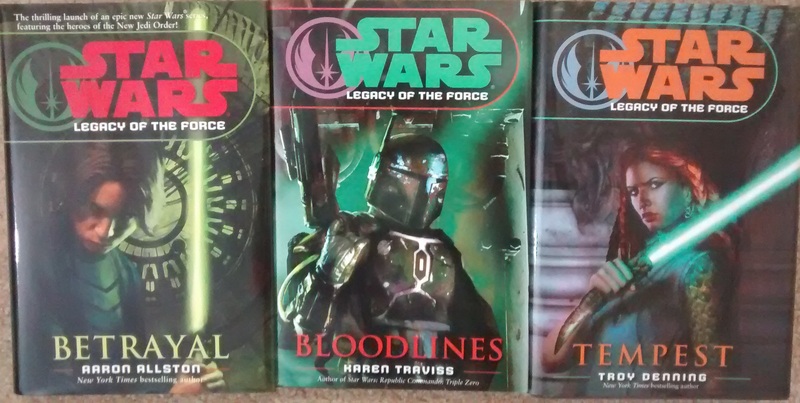 These “Tales” books were good, except for the Bounty Hunter Wars. That was bad. Alien reptiles in robot bodies that eat the Force. 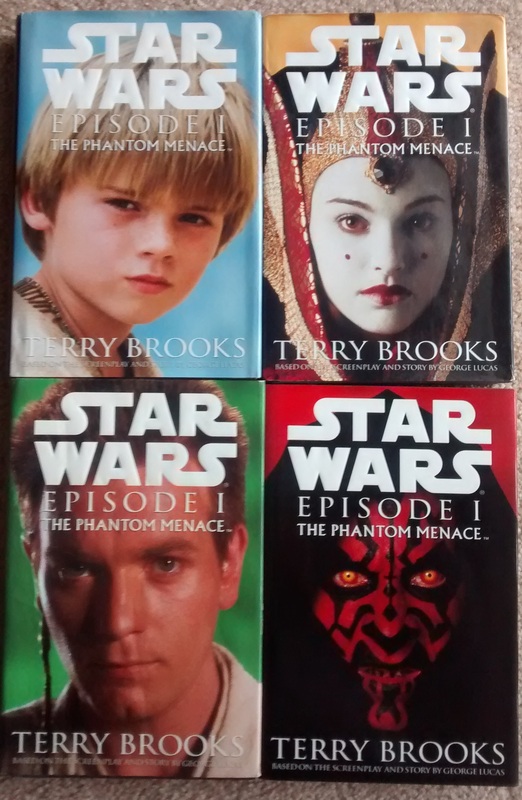 THAT is the quality of story you got in one of these books. I doubt you have to guess very hard which one. You can’t fake this folks, it really was written about and worked into the now defunct EU canon. This was the beginning of the Wild West Era of Star Wars. Luke smashed moons together, Han flew the galaxy. Leia, well, honestly, she didn’t do a whole lot yet. But don’t worry, her heyday is just around the corner. Since the last couple of reads I’ve had just plain stank, I’m taking a week long break from reading and posting reviews. I’m wasting my time on Youtube, so that I can feel ever so superior once I stop next week and posting book covers to keep my blog alive. Self-Righteous Nihilism without apology. And anger. 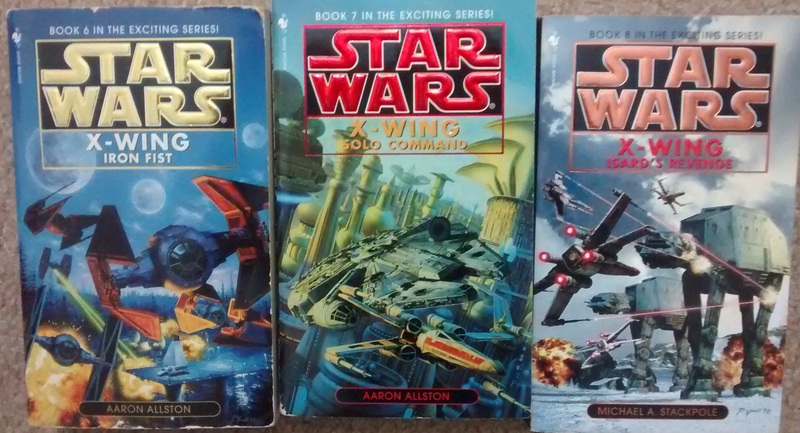 Because Star Wars used to be great (even if the stories were terrible, and let me tell you, some of them were B-A-D!!!!!) and now it’s drunk and puking in the gutters, begging for spare change from any passing stranger. Even Forgotten Realms has more dignity these days. So hearken back with me to the glory days when we all thought Star Wars could be great again. And this brings us up to the Infamous Episode 3. That movie was a dagger in the heart of a lot of fans. Not the story necessarily, but the poor acting, poor writing and poor directing. Lucas is squarely to blame. It took a lot of “I love Star Wars” for me to buy some of these back in the day. What with having 4 books in a row just be beyond stinkers, I’m taking a break from reading for a week. I used to be a huge star wars fan. But that fandom began its death back in ’12 or so and its death throes happened when I watched The Force Awakens. 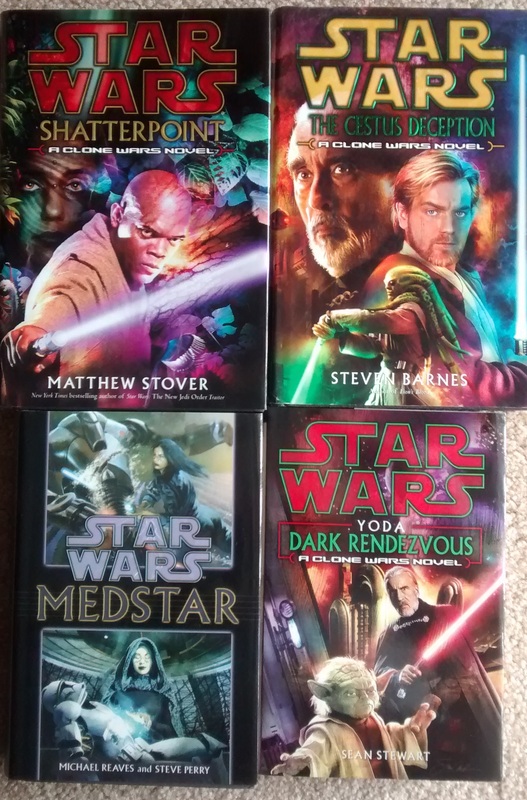 I had been collecting Star Wars books ever since the 90’s though and continued to buy them in hardcover from the Science Fiction Book Club up until I bought Kenobi near the end of ’13. 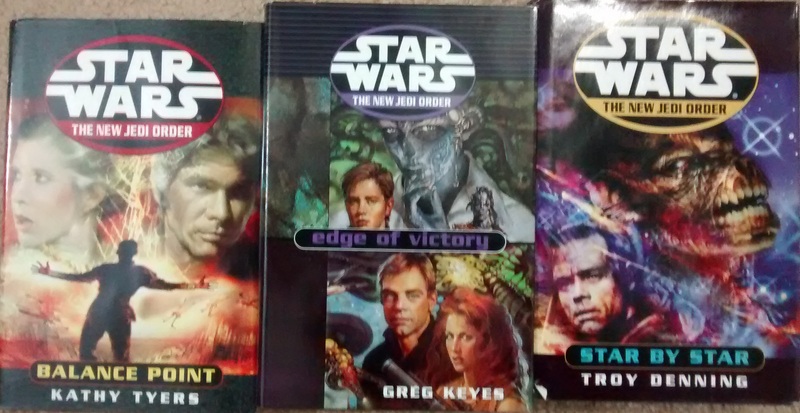 I have accumulated a lot of Star Wars novels, with most of them being in hardcover. They take up 3 shelves, double stacked, on one of my book shelves and honestly, it is time for them to go. 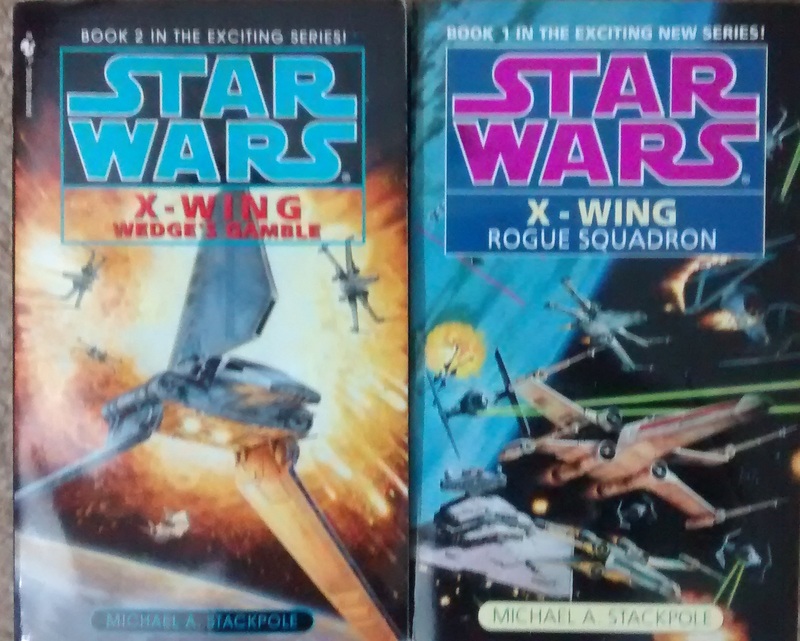 Mrs B wants to keep the X-Wing books as they are just good adventure stories, star wars or no star wars. I don’t know what to do with them all now. So before I make any decisions, I’m just going to do a couple of posts showcasing them all so if I ever feel regret once they’re gone, I can simply look at these posts and be all good. All 4 variant covers for Episode One.